​In the offices of General Artistes in the Oxford Street area of central London, there was an air of great excitement. We were there to listen to our next single release. This song was certainly different. It was the soon to be a smash hit; ’Son Of My Father'. A catchy song with a memorable hook in the chorus. It was offered to Dr Marigold's Prescription and unbelievably we refused it. Looking back it was a big mistake. At this time DMP wanted to go in a different direction musically. This was the more heavier and funkier way. We had aspirations about our musical direction. The story about this song is now history. It was the biggest surprise to us to see Chicory Tip on Top Of The Pops. They were a band attached to the same management as we were. I can say it only really hit me when I heard football fans singing the chorus, with different words, at matches everywhere. What made things worse, every time I heard this, it was on National TV. It seems after we turned the song down it was put away and treated with great secrecy. I have to say the production of the record was up to the high standards of producers Roger Easterby and Des Champ. Our next single would be 'Friend Of Mine'. Written by Ed Welch, writer of our 1970 release Sing Along. Ed Welch went on to write music for a later series of 'Thomas The Tank Engine' and famous TV themes such as 'Blockbusters' and 'Catch Phrase'. He is a real songwriting talent. We thought Friend Of Mine had a good chance to chart, but were wrong. Then another change of record labels for us, this time CBS. We also used a different recording studio, Audio International, in Rodmarton Street, London. Of the artistes who had success there were 'Gilbert O'Sullivan' and 'The Sweet'. We had hope. I was beginning to think 'Friend Of Mine ' would be our last shot at hit record fame. The B side was a dual writing effort from Fred and Dave, 'In Your Own Sweet Way'. We already had this recording in the can, completed much earlier at 'Chalk Farm' studio's in Camden, London. It was to be a B side to another song 'Without A Place To Go’ which was never released as a single but is on our second album. The studio in Chalk Farm was famous for it's great Bass Guitar sound attained on many Reggae recordings. The area of the inside of this studio was about the same as a single fronted shop. I was playing the Hammond Organ just inside of the shop window. The window was painted over. On the back wall behind me were lots of empty egg boxes, a cheap form of sound insulation which worked well for the Reggae sound. This studio was at the other end of the spectrum to Audio International. It was all systems go with 'Friend Of Mine'. Plenty of Radio1 airplay. We adjusted our name slightly by dropping the word Prescription to just 'Dr Marigold's'. This was always a joke on stage: "We dropped the Prescription as we are feeling better now". We bought a new van, a double-wheeled transit in Blue, number plate XGW 504G. After the Commer van this was real luxury. We bought it from a car dealer whose lot was behind Finsbury Park Tube Station. It cost £900. It was so exciting, like starting over. We had the windows blacked and it looked great and was comfortable. We had a new PA system and microphones and stands. Things were looking up for us. 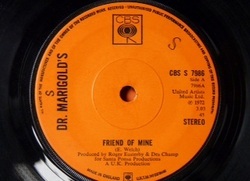 CBS flew the group to St Helier, Jersey to appear on early evening TV to promote 'Friend Of Mine'. We flew from Lydd Airport in Kent on a twin prop airplane and arrived in the early evening. Someone from the TV company picked us up from the airport and drove us to our hotel. We were told that there was a meal ready for us in a private room. We were escorted there, a nicely laid table and behold!! Sitting at one end of the table was the great Johnny Nash. Here we were in Jersey having dinner with Mr Stir It Up. He was promoting his latest release, 'I Can See Clearly Now’ on the same TV show. After the show we went on the town. Loads of pubs with live music then. We ended the night in one of these pubs listening to one of my favourite piano players John Hawken. He was a member of 'The Nashville Teens'. Friend Of Mine, I thought, would be our last shot at the charts. Muddy Water our best shot so far. Time was running away. Having had four serious releases, one of which I forgot to mention. That was a song called 'Breaking The Heart Of A Good Man'. It was our first release with our new management in 1970. This was a powerful sounding production. It was written by a great songwriter named Roger Greenaway. He was the writing partner of Roger Cook. Most Greenaway/Cook songs were destined for chart success. Roger Cook was the the singing partner of Madeline Bell in the group 'Blue Mink'. Roger Greenaway wrote the song used in the Coca Cola advert. We recorded 'Breaking The Heart' at De Lane Lea studios in Kingsway, London. Roger Greenaway turned up for the session, surely a good sign. Despite lots of airplay, like all of our records, we had little success. With Friend Of Mine on the move we were getting even more live gigs. One which needs a mention; it was The Palace Lido on the Isle Of Man. This was by far the largest ballroom I had ever seen. We travelled on the ferry from Liverpool Docks. It was a rough sailing on that Irish Sea. Those boats were unrefined and very basic back then. The prize at the end of our journey was a stay in the lovely Palace Hotel. We got to see the island and had a lot of free time. There is another story about the Lido. About seven years ago I went to a pub in South Wimbledon, there was a group playing called Cry Wolf. I recognised two members who were brothers. One was a Drummer, the other a Bass Player. They were both members of the 70’s hit band, Blackfoot Sue. We had something in common, they also played at The Lido. They told me they flew to the Isle Of Man, we slummed it by ferry. That was the subtle difference between Hit Record and No Hit Record. We were now asking ourselves questions. We had a vocalist, Fred, with a fantastic voice. His voice stood up well on record. We were a tight unit with experience. We just needed the right song. History has proven that even with a No.1 record a band didn't get all the just rewards financially. I think even if we had accepted 'Son Of My Father’, financially we would have been no better off. The way the royalties were shared, record company, management, songwriters and other expenses, the musicians usually took the smallest cut. After all this hard work we were later to have another single release on CBS. There had to be another way.